The variations of the meltwater runoff draining from Kartamak Glacier in Mt. Muztag Ata in China were studied by using the measured hydrological data from 1 June to 25 August 2003. The meltwater runoff is mainly affected by ambient temperature and precipitation. Meltwater and precipitation samples were collected from 10 to 23 August 2003. Their pH, EC (electric conductivity) and the major ions (Na+, K+, Ca2+, Mg2+, Cl−, No3 −, SO4 2−) were determined. pH values showed a positive correlation with EC values for all samples. Meltwater samples were slightly alkaline. Sulfate and calcium were the dominant anion and cation in the measured ions, respectively. All the ion concentrations had inverse relationships with runoff or water level. 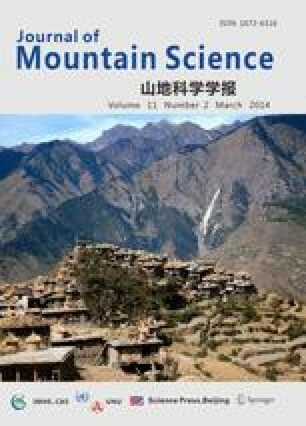 In order to discuss the origins of dissolved chemical substances in the glacial meltwater, a principal component analysis was carried out. The results showed that water-rock interaction determined the ion components of the meltwater.